Flight Tickets to and from Port Blair. after Finishing the Sightseeing Tour as per the Itinerary. meals / Beverages Ordered At Hotel. waiting for Ferry At Jetty. honeymoon Inclusions) During Your Stay. from 15th December to 20th January). Anything that is Not Mentioned in the Package Inclusions. Arrival At Port Blair By Flight. Our Tour Representative Will Be Present Holding Placard with Your Name At Airport. After a Brief with Our Representative You Will Be Taken to Your Hotel. Check-in and Relax There. after Lunch, Proceed to Visit Corbyn's Cove Beach Which is a Coconut Palm Fringed, Tranquil Sandy Beach with Blue Sea Water Making It Ideal for Sun-bathing and Swimming and Water Sports Activities like Jet-ski Ride and Speed Boat Ride. after Relaxing and Enjoying At this Pleasant Beach, Visit Cellular Jail (a Colonial Prison Used By the Britishers to Exile Prisoners of Freedom Struggle to this Remote Archipelago) and Watch Sound & Light Show (son-et-lumiere) in Which the Heroic Saga of Our Freedom Fighters During Freedom Struggle is Brought Alive. on Completion, You Will Be Dropped Back to Your Hotel for Overnight Stay At Port Blair. In the Morning After Breakfast, Proceed to Visit Ross Island and North Bay. First You Will Be Taken to Rajiv Gandhi Water Sports Complex from Where You Will Board a Boat to Reach Ross Island. Ross Island Was the First Headquarter of the British Colony in These Islands. The Main Attraction of this Island are the Ruins of Some of the Buildings that Were Built During British Period, a British Church, Mansion, Market, Etc. You Can Spot Number of Peacocks, Deers and Ducks At the Island. The Place Gives Picturesque Views from all Around. After Exploring this Historical Island, You Will Again Board a Boat from Ross Island to Visit North Bay. North Bay is also Known as Coral Island. Its Rich Under Water Corals Makes this Island An Ideal Place for Many Water Sports Activities like Snorkeling, Scuba Diving, Sea Walk and Glass Bottom Boat Ride. After Enjoying in this Beautiful Island, You Will Get Back By Boat to Rajiv Gandhi Water Sports Complex and Relax for Some Time At Marina Park. After That, Proceed to Visit Chidiya Tapu (approx 28 Kms. Away from Port Blair in the Southernmost Tip of South Andaman). Chidiya Tapu is also Known as the 'sunset Point' and 'bird Island'. It is a Small Village with Lush Green Mangroves, Tranquil Islands and Forest Bestowed with Numerous Chirping Birds, Its Turquoise Blue Sea Water and Soft Sandy Beach, Making It An Ideal Spot for Picnic, Sit-out, Swimmning, Sun-bathing and Long Beach Walk. Chidiya Tapu is Well Known for Its Rich Collection of Birds, Green Landscape, Crystal Clear Water and White Sand, Enthralling Beaches, Colourful Sea-shells, Variety of Corals, Vivid Butterflies and Most Significantly, the Exquisite View of the Sunset in the Horizon. The Main Attractions Here Include the Chidiya Tapu Biological Park, Chidiya Tapu Beach and Munda Pahad. After Enjoying in the Exquisite Chidiya Tapu Beach, Witness the Stunning Sunset in the Horizon in the Evening. After That, You Will Be Dropped Back to Your Hotel for Overnight Stay At Port Blair. 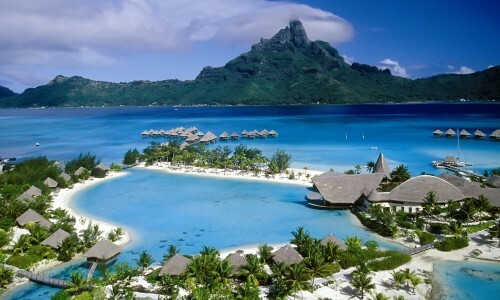 In the Morning, Check-out from Hotel and Proceed By a Private Ferry/cruise to Havelock Island. On Arrival, Our Representative Will Give a Brief and Take You to Your Hotel. Check-in and Relax There. 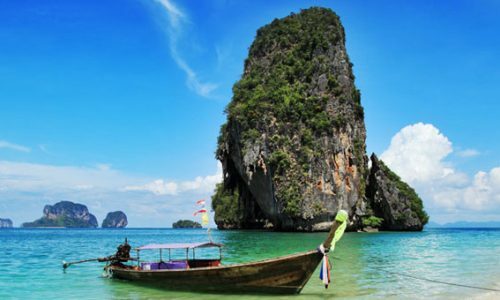 After That, You Will Proceed to Visit Elephant Beach and Radhanagar Beach (ranked among Asia's Top 10 Beaches). To Visit Elephant Beach, First You Will Be Taken to the Jetty from Where You Will Board a Boat to Reach Elephant Beach. The White Sand Beach, the Blue Green Water and the Rich Coral Reef At the Elephant Beach Makes It One of the Best Places for Water Sports Activities like Snorkeling, Sea-walk, Glass Bottom Boat Ride, Jet-ski Ride, Banana Ride and Sofa Ride. After Enjoying in this Pristine Beach, You Will Get Back to Havelock Island Jetty and After that You Will Be Dropped At Your Hotel for Lunch and Relaxation. After Having Lunch, Visit Radhanagar Beach Which is Locally Known as Beach No. 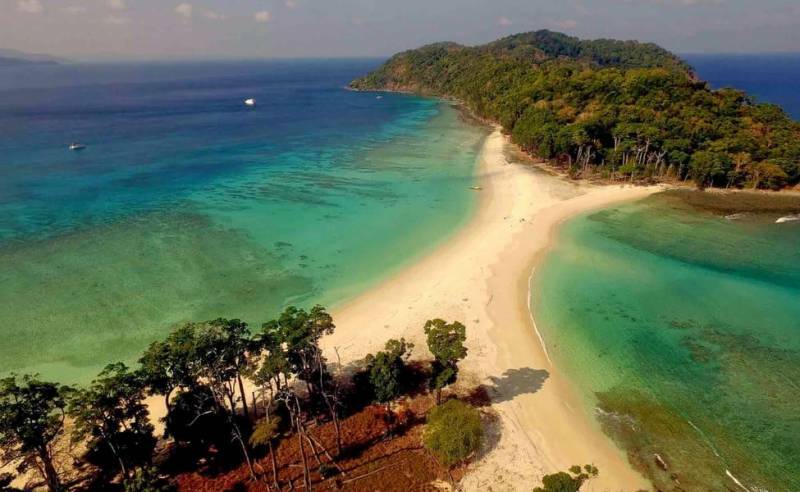 7 and is the Most Beautiful Beach in Andamans is the Best Place for Beach Sit-outs, Beach Walk, Swimming, Sun-bathing, Relaxation and Watching Sunset. This Beach Has Got the Finest Hue of Unending Sky, Frolicking Waves, Thick Sands, Flora and Fauna. The Sun's Rays Bounce Off the Pure White Sand Making It Sparkle and Glitter like Diamonds. The Clean and Composed Ambiance with Farseeing White and Silky Sand Gleaming Beneath the Turquoise Blue Waters is a Perfect Beachscape to Take Those Long Walks At An Ideal Sunset Brimming Over the Horizon. After Witnessing the Stunning Sunset in the Horizon At Radhanagar Beach, You Will Be Dropped Back to Your Hotel for Overnight Stay At Havelock Island. In the Morning, Check-out from Hotel and Proceed to Visit Kalapatthar Beach. Kalapatthar Beach is a Small and Quiet Beach. The Colour of the Water is So Unique and Beautiful with Silvery Sand Making this Beach a Great Place to Relax. The Beach Has Got Its Name from the Black Rocks that Adorn the Coastline Here. 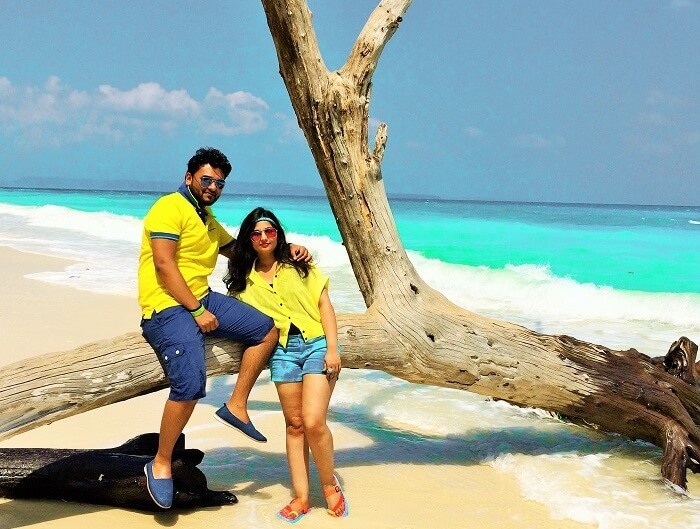 After Enjoying in this Pristine Beach, You Will Get Back to Havelock Island Jetty. From There You Will Be Boarding a Private Ferry/cruise to Neil Island. On Arrival, Our Representative Will Give a Brief and Take You to Your Hotel. Check-in and Relax There. After That, You Will Proceed to Visit Bharatpur Beach and Laxmanpur Beach. 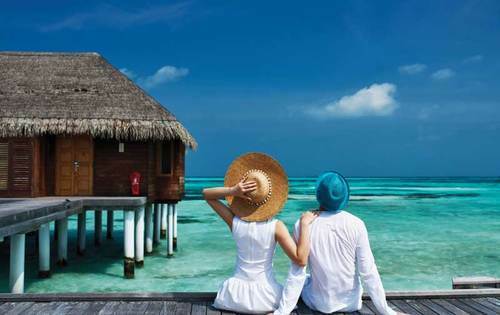 Bharatpur Beach is Known for Its Pristine Clear Blue Water and Rich Colourful Coral Reef Making It Ideal for Water Sports Activities like Snorkeling, Scuba Diving, Jet Ski Ride, Speed Boat Ride and Glass Bottom Boat Ride. Laxmanpur Beach is Known as the Sunset Point At Neil Island and is Very Wide and Long. This Beach is also Known for Its Unique Natural Coral Bridge Formation Locally Known as Natural Hawrah Bridge. The Beach Has White Shell Sand with Shallow Water Making It Perfect for An Evening Walk. After Enjoying in These Serene Beaches and Witnessing the Stunning Sunset in the Horizon At Laxmanpur Beach, You Will Be Dropped Back to Your Hotel for Overnight Stay At Neil Island. In the Morning, Check-out from Hotel and Proceed to Visit Sitapur Beach. Sitapur Beach is Known as the Sunrise Point At Neil Island. The Beach Contains White Silver Soft Sand with Excellent Scenic Beauty, Limestone Formation, Natural Vegetation and Palm Trees Offering Plenty of Shades, Water is Turquoise and Transparent Making this Beach An Ideal Place for Swimming. After Enjoying in this Serene Beach, You Will Get Back to Neil Island Jetty. From There You Will Be Boarding a Govt. Ferry to Return Back to Port Blair. On Arrival, Our Representative Will Take You to Your Hotel. Check-in and Relax There. After Lunch, Proceed for City Tour Which Includes Visit to Fisheries Museum (aquarium), Anthropological Museum, Naval Marine Museum (samudrika), Zoological Survey of India Museum and Sagarika Emporium (the Cottage Industries) for Shopping. A Non-alcoholic Welcome Drink / Beverage for Each Individual On Arrival At Port Blair. A Flower Bouquet On Arrival At Port Blair. standard of Hotel Will Be Provided. blair, Havelock Island and Neil Island. All Sight-seeing Program as Mentioned in the Itinerary. Vehicle in Case of Any Medical Emergency. on-call Assistance During Your Stay.